Wanting to get some apps or games for your Android devices? To celebrate the holiday, Amazon is giving away $5 Amazon Appstore credit for free, which is good for any purchase within the Amazon Appstore. So if you own a Kindle or plan to buy some apps or games from Amazon Appstore, why not claim the free $5 to reduce the price or even get some of them for free. And be quick, as the offer ends on December 28, 2013. Download and install the Amazon Appstore from http://www.amazon.com/getappstore (aff). Note that to install Amazon Appstore app, apps from unknown sources must be allowed to be installed on Android. To change the setting, open “Settings” and navigate to the “Unknown Sources” option (under Applications or Security depending on your device). If you already have Amazon Appstore app installed (but not on Kindle Fire), just make sure that it’s update to latest version with at least version 7.5 or greater. The version information could be found in “Settings” > “Version and Release Notes”. If you have an earlier version of the Appstore, tap “Check For Update”. In the Amazon Appstore app, download any app or game, even a free one. 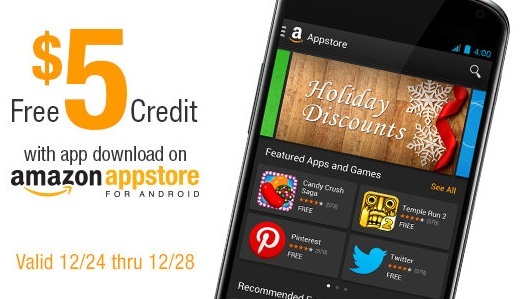 If you choose a free app or game, you effectively earn $5 in Amazon Appstore credit for free. The app must be downloaded between 12:00 AM (EST) December 24, 2013 and 11:59 PM (PST) December 28, 2013 to receive the $5 promotional credit. In addition, the offer does not apply to Kindle Fire, Kindle Fire HD and Kindle Fire HDX tablets. The $5 credit will automatically be added into your account, and a confirmation email will be sent. To use the $5 promotional balance, just purchase any game or app through 1-click payment method. The 1-click payment method will not be charged unless your purchases exceed the promotional balance. Tip: To view the Amazon Appstore promotional credit balance, click on Redeem a gift card or promotion code & view balance link at the bottom of “Buy now with 1-Click” or “Spend Amazon Coins” button. The $5 promotional credit expires on March 31, 2014 at 11:59 PM (PST), so do remember to use the credit to purchase any app or game before the expiry date.